This Drocon represents itself a good bang for the buck. It is one of the best models for kids and beginners we’ve seen so far. The 818A PLUS can be found as an UDI or Force1 models: watch out as there are different prices with more than $30 of difference. Today we’re going to take a look to the DROCON U818A PLUS, a mid-range drone aimed to kids and beginners who want to learn the basics of flying a drone. The flight time comes close to 15 minutes. The specifications state that it reaches 15 minutes but none of the flights we made with the drone were as long as that. The battery has 1000 mAh and takes almost 3 hours to get it fully charged. The battery is proprietary, as most of the long range drones have. This in not bad itself, but means that you cannot use other UDI or Drocon batteries with this drone. We could not find spare batteries for the drone. In case you need them, you’ll have to address your enquiry to the manufacturer (view site) and cross the fingers. 150 meters. This is not really impressive on a drone of this kind. On top of this, some users have reported to have issues when the drone is 70-80 meters far away. One of the unique selling points of the U818A PLUS is its camera. The camera is optically stabilized, meaning that their optical elements are floating to absorb the micro vibrations to delivers (almost) perfect sharp images. The camera features a 720p sensor with the 120° wide angle lens, f/2.0 wide open. Oh, and It can be removed completely from the drone. 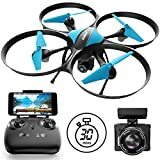 Automatic Take-Off and Landing Function: One key take off/land – like many beginner friendly drones, the U818A Plus has a one key take off/land functionality that lets you easily get the drone up in the air and then land later on when the battery is spent or your done flying the drone for the day. Customer Flight Route: Draw a flight line on the appointed area of the mobile phone screen. The drone will fly according to the flight line. Emergency stop and alarms: The U818A Plus has a number of safety features which are great for beginners. For instance, the drone will stop and land safely if there are any issues detected. 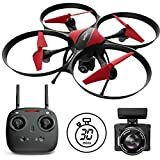 If the battery is running out of power or the drone is going out of range, the alarm will start beeping to warn the user about it. Speed control: There is not a variable speed control. Setting the speed is done by selecting a low, mid or high speed modes. That’s all. FPV control: FPV is supported through Flyingsee app (Android and iOS available). VR mode: VR can be turned on within the FPV app to give pilots a more immersive experience. Important! VR glasses are not included. The DROCON U818A Plus is a larger drone with about 15 inches in length/width and around 7.5 inches in height. Blades have non removable flexible propellers guards. Yep, depending on the crash, these guards are useless as they can collide with the propellers and could break them. Each rotor has a LED underneath it by the way. Three settings for speed: Slow, mid and high, suitable for all users. Headless mode: The onboard flight computer always aligns the drone movements to be relative to the controller. So it does not matter which way the drone forward direction is pointing. When you push forward, the drone moves forward relative to your direction, not the heading of the drone. HD camera: Comes with 720p camera and 120° wide angle lens. Set of extra propellers included in the package. More: micro SD included (4GB card), low battery alarma, camera tilt and more. Poor battery performance. Short flight time. As I’ve said, this drone is sold under different brands. The manufacturer, UDI, licenses to other resellers and there could be some price differences. I’ve found out three variations, see them! 1-10-18: Poor battery performance? What are you talking about? This is one of the FEW under $125 drone that exceed 10-minute flight time. I routinely get 15 minutes, often getting closer to 16 minutes. With fairly stiff breezes I have still been getting over 14 minutes consistently. I just had one of my two drones fly away (took too high, too far, lost signal). Looking for backup and checking prices here.